Georges Braque (May 13, 1882 – August 31, 1963) was a major twentieth-century French painter and sculptor who, along with Pablo Picasso, developed the art movement known as cubism. Georges Braque was born in Argenteuil, France to Charles and Augustine Braque. As far as siblings were concerned, he only had his older sister, Henriette. He grew up in Le Havre and trained to be a house painter and decorator as his father and grandfather were, but he also studied painting in the evenings at the École des Beaux-Arts in Le Havre from about 1897 to 1899. He apprenticed in Paris under a decorator and was awarded his certificate in 1902. The following year he attended the Académie Humbert, also in Paris, and painted there until 1904 thanks to funding from his parents, who were relatively well-to-do. Braque studied art with the understanding that if he didn't succeed, he could always take over the family business. It was during his time at Académie Humbert that he met Marie Laurencin and Francis Picabia. Braque generally felt that the professors at Humbert cared little for their students' work and had poor eyes for recognizing talent and innovation. However, Braque enjoyed the lax nature of his classes and the ability to experiment and more or less do whatever he wished, artistically. His earliest works were impressionistic, but after seeing the work exhibited by the Fauves in 1905 Braque adopted a Fauvist style. The Fauves, a group that included Henri Matisse and Andre Derain among others, used brilliant colors and loose structures of forms to capture the most intense emotional response. Braque worked most closely with the artists Raoul Dufy and Othon Friesz, who shared Braque's hometown of Le Havre, to develop a somewhat more subdued Fauvist style. In 1906, Braque traveled with Friesz to L'Estaque, to Antwerp, and home to Le Havre to paint. 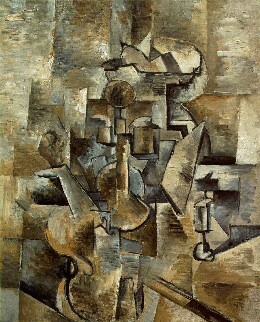 In May 1907, Braque successfully exhibited works in the Fauve style in the Salon des Indépendants. The same year, Braque's style began a slow evolution as he came under the strong influence of Paul Cézanne, who died in 1906, and whose works were exhibited in Paris for the first time in September 1907. Braque's paintings of 1908–1913 began to reflect his new interest in geometry and simultaneous perspective. He conducted an intense study of the effects of light and perspective and the technical means that painters use to represent these effects, appearing to question the most standard of artistic conventions. In his village scenes, for example, Braque frequently reduced an architectural structure to a geometric form approximating a cube, yet rendered its shading so that it looked both flat and three-dimensional. In this way Braque called attention to the very nature of visual illusion and artistic representation. Beginning in 1909, Braque began to work closely with Pablo Picasso who had been developing a similar approach to painting. Both artists produced paintings of neutralized color and complex patterns of faceted form, now called Analytic Cubism. In 1912, they began to experiment with collage and papier collé. Although some of Picasso's papier collés survived, all of Braque's were either lost or destroyed. Braque himself admitted that many of his ventures into sculpture and other mediums were merely breaks from his true work and studies in form that would later help inspire his paintings. Picasso often looked to Braque for approval while developing his painting style, sometimes boasting to art art dealers that Braque had approved of a particular painting. It was Picasso who introduced Braque to Marcelle Vorvanne, whom Braque eventually married. The two painters were good enough friends that Picasso's even had a nickname for Braque: "Wilbourg"—Picasso's approximation of "Wilbur," as in Wilbur Wright, one of the pioneering brothers of aviation. The productive collaboration between Braque and Picasso continued until 1914 when Braque enlisted in the French Army, leaving Paris to fight in the First World War. Braque was severely wounded in the war when a piece of shrapnel from a mortar shell split his skull open. When he resumed his artistic career in 1917 he moved away from the harsher abstraction of cubism. Working alone, he developed a more personal style, characterized by brilliant color and textured surfaces and—following his move to the Normandy seacoast—the reappearance of the human figure. He painted many still life subjects during this time, maintaining his emphasis on structure. During his recovery he became a close friend of the cubist artist Juan Gris. As he mentioned in his notebooks, Braque felt that, "There is only one thing in art that has value: that which one can not explain." He also claimed that the goal of art was to disturb, as opposed to science, which was meant to reassure people. He continued to work throughout the remainder of his life, producing a considerable number of distinguished paintings, graphics, and sculptures, all imbued with a pervasive contemplative quality. He died August 31, 1963, in Paris. This page was last modified on 19 June 2017, at 15:22.